The introduction of the chariot was believed to have occurred during the period of the Middle Kingdom from when chariots were introduced by the Asian Hyksos armies who invaded the Delta during the period of the Middle Kingdom. Spears and Bows and arrows were the weapons used by the charioteers however, war chariots were used as weapons in themselves as they could terrorize and scatter an enemy force by charging them - it is believed that some war chariots had spiked and bladed wheels which could hak the enemy to pieces. The Hyksos also introduced bronze technology to the Ancient Egyptians. Up to this point important personages such as Pharaohs were transported by litters. The introduction of the War Chariot in Ancient Egypt revolutionised war tactics in Ancient Egypt moving away from the limited and light weapons carried by the infantry to a highly mobile army able to carry a substantial amount of weaponry. The chariot was ideally suited to the flat landscapes of Egypt and surrounding countries. The Egyptians used ceremonial chariots for great processions. These chariots were heavier than the war chariots and were inlaid with semi-precious stones, gold, silver and bronze and decorated with highly ornate designs. These chariots were not built for speed or manoeuvrability they were built for effect. They were also built for comfort and large umbrellas were attached to offer shade to those who rode in them. The Ancient Egyptians used the Chariot for hunting purposes. The hunting chariot offered speed and allowed an archer to concentrate on the prey rather than the horse. 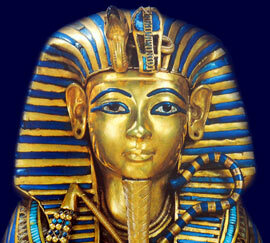 The Pharaohs favored this form of hunting and were accompanied on such expeditions by large number of their armies. These chariots were also inlaid with semi-precious stones, gold, silver and bronze and decorated with highly ornate designs. The Egyptians used the Chariot for sporting events and competitions. Skilled charioteers were valued and the Ancient Egyptians enjoyed the additional excitement of gambling on the outcome of these events. The winners of sports contests involving chariot races were rewarded with money and special large collars known as the usekh which half covered the shoulders and chest. This form of transport was extremely expensive and therefore only royalty or the very rich would be able to afford to keep a chariot and its horses as a form of transport.